This book looks at the short conflict which took place in southwest West Virginia when violence escalated, first when private detectives in the pay of the coal companies got into a gunfight with locals in Matewan when the detectives came out to evict the families of miners trying to unionize. and then exploding when the local pro-labor constable, Sid Hatfield, was shot down on the steps of the courthouse in Welch by detectives in broad daylight as he was about to go to trial. The detectives were freed on bail. The situation rapidly spun out of control as miners collected their rifles and pistols and decided to march to free other miners being held on murder charges related to the Matewan incident. It became clear that state police could not stop the men and there was no National Guard in West Virginia at the time, so federal troops were brought in to restore order or, if necessary, fight the miners. General Mitchell sent fighters and bombers to suppress the uprising. The United States appeared to be on the verge of another civil war. This is an amazing story, one I was only vaguely familiar with. 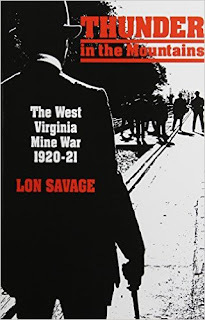 Mr. Savage has written a great book on this topic, bringing several of the characters to life discussing the political and social issues involved in coal mining in the 1920s. His book is detailed without getting bogged down in details. If you only want to read one book on this topic then this should be the one. Includes black and white photos.